PORTO SEGURO, Brazil—Germany has taken the “tiki-taka” passing game so intrinsically used by Spain to another level at the World Cup in Brazil, by adding ruthless efficiency to the possession philosophy. Germany is one win from capturing its fourth World Cup title following the astonishing 7-1 demolition of host Brazil in the semifinals. Spain beat Germany at two major tournaments and coach Joachim Loew was so impressed by the Spanish game that he has taken over many aspects and, of course, added some of his own flourishes. Germany likes possession, just as Spain did, but Loew’s team avoids endless wide passing and prefers to push forward at every occasion. When Germany wins the ball in its half, Loew wants his players to pass it quickly forward, hoping to outnumber the opposing defense. The result is that Germany creates many chances and scores plenty of goals. Spain’s minimalists scored eight goals in winning the 2010 World Cup — Germany already has 17 here, with one match remaining to play. Spain beat Germany in the final of the 2008 European Championship and again in the semifinals of the 2010World Cup. But while Spain’s game was based on endless possession and passing until an occasional chance was created, Loew’s lineup is happy to attack and take risks. It worked perfectly against Brazil, as the historic result illustrates. It may help that six of Germany’s field players come from Bayern Munich, which has been coached by Pep Guardiola for one season. Guardiola was the mastermind of “tiki-taka” and won 14 titles in four seasons in charge of Barcelona, including two Champions League crowns. Barcelona inspired Spain’s game that brought two European championships and a World Cup title. Loew also adopted the notion of a “false nine” system without a true striker, another idea borrowed from Spain. But when Germany had some trouble in earlier matches in the tournament in Brazil, Loew did not hesitate to revert to starting Miroslav Klose, the only true striker in his team. Klose has scored two goals in Brazil and has become the top scorer in World Cup history when he netted against Brazil for his 16th goal in four tournaments. Germany’s talented midfielders rotate positions constantly, they are always on the move and any is capable of scoring. Thomas Mueller has been the most prolific with five goals so far, either playing as a winger with Klose in the lineup or as forward when Klose is on the bench. Sami Khedira and Toni Kroos shone against Brazil, with the latter scoring twice and playing a role in the first four German goals, while Khedira netted once in his best match of the tournament. But they are also not shy to defend. Germany has shown it can win even when it doesn’t have more possession — France had as much as Germany and lost 1-0 in the quarterfinals. Brazil had 51 percent, with the known outcome. Still, Germany tops the tournament in completed passes at 3,421, nearly three times the average. 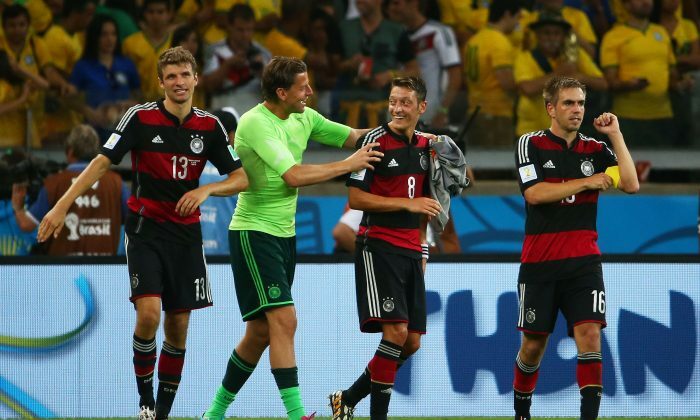 Philipp Lahm with 458 passes and Kroos with 443 lead the tournament. Spain completed 4,773 passes in winning the 2010 title.